At the end of regulation time Mahaffey & Nickell were deadlocked at 109-109, which meant a tie break. 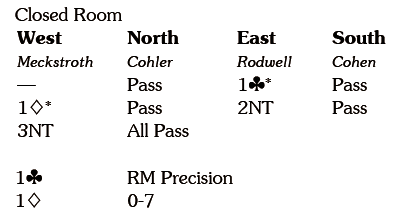 South led the 7and declarer won with the ace and ran the jack of hearts, North winning with the king and switching to the J. Declarer put up the king and South withheld the ace! 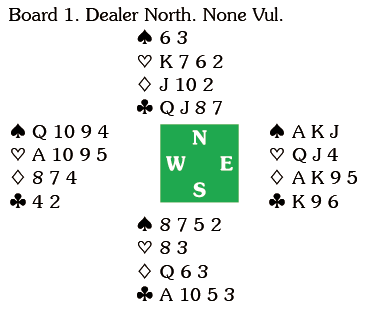 The convention card says the jack promises ‘Q from 4+ cards, top from 3 or fewer’. Declarer played off his major suit winners pitching a diamond and when both defenders also parted with a diamond declarer had eleven tricks and surely a match winning position? South led the 7 and declarer won with the king and ran the J. Here North won and switched to the diamond jack. 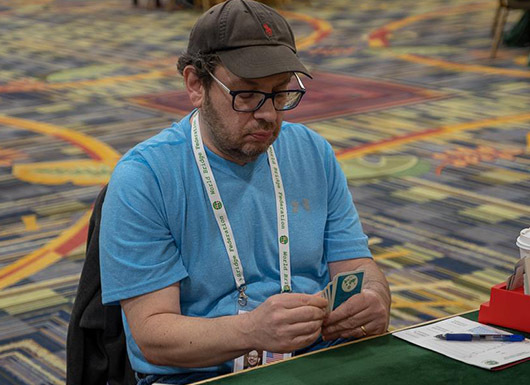 Declarer won with the ace, crossed to dummy with a heart and ran the 7 which led to an overtrick – again EW must have thought they were in the box seats. 1NT was presumably 10-12 and South’s 2 and West’s 3 were transfers. South led the A and when North followed with the ten he switched to the A followed by the nine. North won and exited with a heart, covered by the jackand king and ruffed by declarer who came to hand with the A. If he now cashes the Q, ruffs a diamond and plays off dummy’s trumps he executes a double squeeze for an overtrick. Missing this he lost a club at the end, +140. 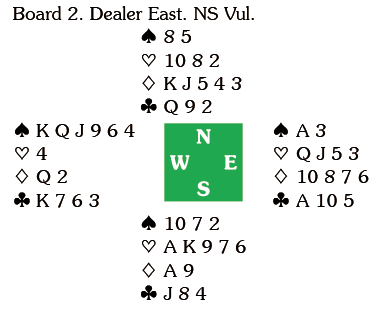 North led the 2 and when declarer played dummy’s three South won with the king and tried to cash the ace. Declarer ruffed, drew trumps, crossed to dummy with a club, disposed of his diamonds on the established hearts and played clubs, taking eleven tricks and a place in the next round.